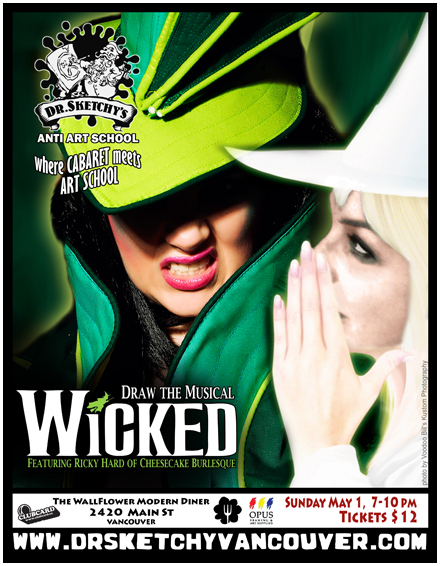 To celebrate "Wicked" and its first Broadway Theatre Tour in Canada, Ricky Hard will star as the Wicked Witch of the West in our musical themed drawing class! Grab your pencils and see what the Wicked Witch looked like before Dorothy dropped in! On April 28, Shary Contrary will be speaking about Dr Sketchy's at the Vogue Theatre for Pecha Kucha- an event where artists, architechs and creative leaders talk about their projects! Talks last for 6 minutes with 20 images lasting 20 seconds. Check out Pecha Kucha's website and get your tickets here. Posted in 2011 and tagged with Ricky Hard. May 1, 2011 by Shary Contrary.